Caveat lector – reader, beware of Samuel Lewis! Thatched cottages on Main Street in Adare, County Limerick. This village was redeveloped by the Earls of Dunraven in the 19th century to become one of the most orderly and picturesque villages in Ireland. Some years ago, as part of my MA in the History of Art and Architecture at the University of Limerick, I was given an assignment to write a research essay on a small or medium sized building. Dr John Logan allowed his class to pick a building created between 1660 and 2000 for the assignment – but I really wanted to look at a medieval building. I thought that St Mary’s Cathedral in Limerick would suit, but then I realised that nobody had really researched the former Trinitarian Priory in Adare, County Limerick, which was restored from ruin for use as a Catholic church in the 19th century. Dr Logan thought this was a great idea – the building was enormous (Adare was a small but beautiful village, after all) and I would concentrate on just the period from about 1811 (the traditional date of the restoration) to about 1884, when the church was extended. 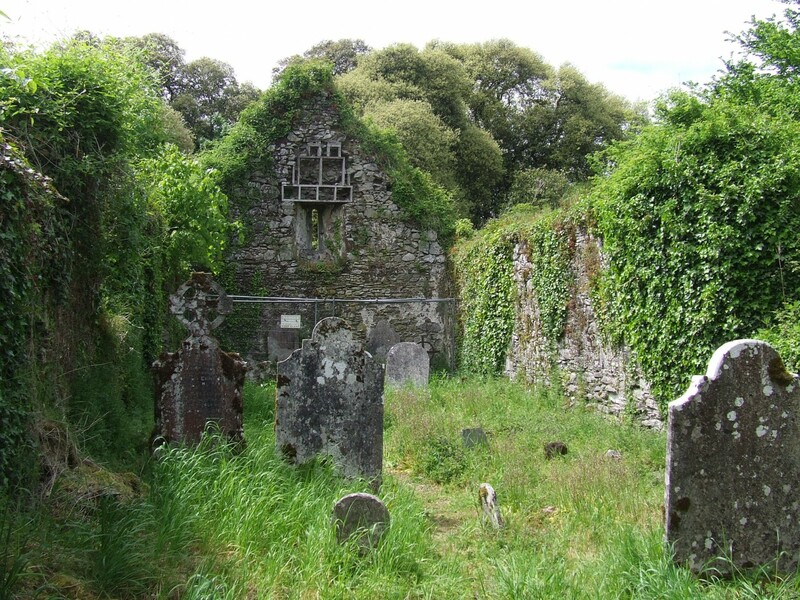 I read everything I could get about the medieval churches of Adare, only to discover that one ‘standard’ source used by many local ‘historians’ in Ireland was wrong. That source, The Topographical Dictionary of Ireland, published by Samuel Lewis in 1837, is the bane of many an Irish historian’s life, especially when confronted by ‘local history’ given out by ‘local historians’. Let me give Adare as one example. Yes, I know Adare isn’t near Midleton, but I’ll move back to south-east Cork shortly. A word of warning, my opinion here might seem pedantic, but it IS important to avoid people assuming that Lewis was always right. 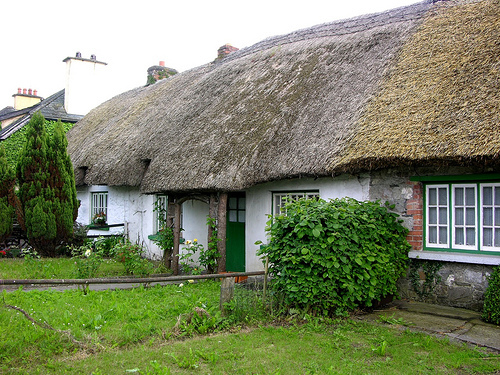 According to Lewis, Adare had three religious houses in the medieval period – this was indeed correct. Lewis tells us that the first of these was a ‘monastery…..dedicated to the to the Holy Trinity’ He then says that it was called ‘the Black Abbey.’ Firstly, it wasn’t dedicated to the Holy Trinity. Rather it was dedicated to St James the Great, or Santiago, as the Spanish call him. It was actually the Priory of St James of the Order of the Holy Trinity for the Redemption of Christian Captives – the order of the Holy Trinity raised money to ransom Christians captured by the muslims. 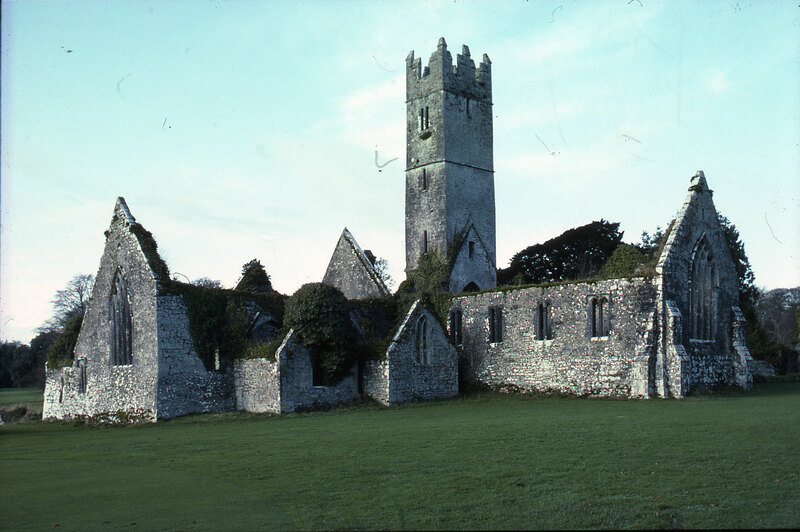 Adare was the only house or priory of that order in Ireland. Today the restored church is dedicated to the Holy Trinity – poor St James has been pushed aside. 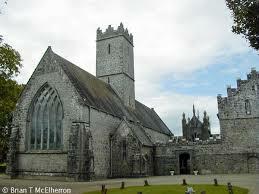 Lewis then tells us that this was known as the ‘Black Abbey.’ This, too, is wrong – there WAS a ‘black abbey’ in Adare – but the Trinitarians were known as the white monks (as were other orders) from their white habits. So their priory was actually the White Abbey. Built in the 1200s for the Order of the Most Holy Trinity for the Redemption of Christian Captives, the Priory of St James in Adare was the only house of this order in Ireland. It was the first of the three houses of religious orders founded in Adare. The ruined medieval church consisted of the part nearer the viewer from the west window to the tower and included the chancel beyond. This was restored in 1809 for use by the Catholics of Adare as their chapel. The large nave on the left of the viewer was added in the years 1882-1884 on the site of the vanished cloister. 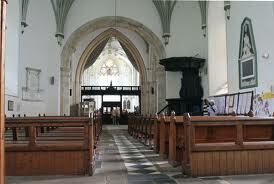 The church is now called Holy Trinity Abbey church and still serves as the Catholic parish church. Lewis goes on to say that the second ‘monastery’ was built in the demesne of Adare Castle, but fails to mention the order to which it was assigned. Actually, he does mention the order, but only relation to the third ‘monastery’. This third monastery he assigned to the Franciscans and he says that it was restored by the Earl of Dunraven for use by the Church of Ireland, with the conventual buildings being restored to house a parochial school. In fact, the second religious house that Lewis mentioned was actually the THIRD one in the sequence to be built – for the Franciscans! So not only has Lewis got the sequence of the buildings wrong – he gave them to the wrong religious order! The third of Lewis’s buildings was actually the second one to be built – this was the REAL Black Abbey because the Augustinians who occupied this priory wore black habits. 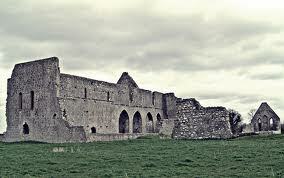 The Franciscans came later – they wore grey habits, hence their friary was the Grey Abbey, or Poor Friars. 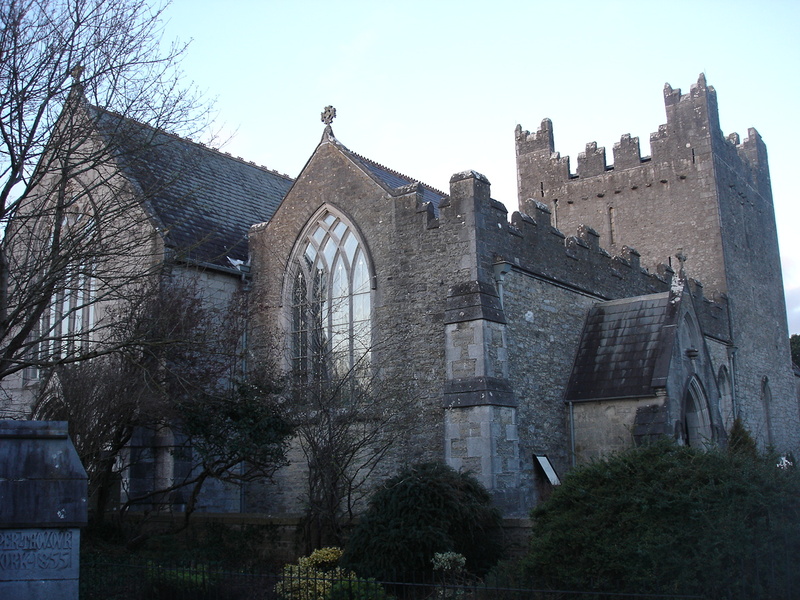 The second religious community in Adare were the Augustinians or Black Friars. 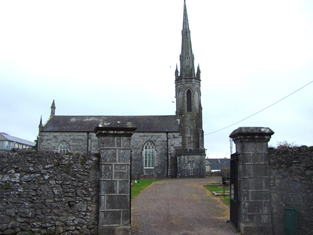 Their priory church was the frist to be restored for use by the Church of Ireland in the first decade of the 19th century. The cloister survives and the conventual buildings on the right were restored for use as a school. Geraldine, Countess of Dunraven, described this as ‘the most ethereally beautiful church interior in Ireland.’ I can vouch for it! To cap it all, Lewis even got the date of the restoration of the Trinitarian church wrong – he said that it was restored for the Catholics in 1811, but I actually discovered that it was restored in 1809. Given that Lewis pubished his book in 1837, he surely could have got that fact right! ‘This place, called anciently Chore Abbey and Castrum Chor derived both its origin and ancient name from the foundation of a Cistercian monastery, in 1182, by Barry Fitzgerald, who placed in it monks from the abbey of Nenay, or Magio, in the county of Limerick. The abbey, from its situation near a ford, was called ‘the abbey of St Mary de Chore’, and the village which afterwards arose near it was for the same reason called Bally-na-Chore (now Ballinacurra), or ‘the town on the ford’…..
Oh dear! You will already have read, in my previous posts, about the pre-Norman village of Ballinacorra and its origins. Feel free to ignore Lewis on the medieval history of Ballinacorra. 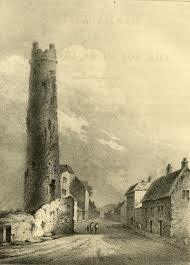 As for his version of the medieval origins of Midleton…..I’ll try to be polite, but it’s difficult! 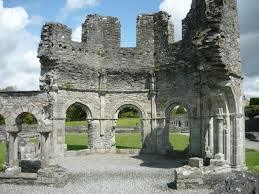 Lewis says that a Cistercian abbey was founded on the site of Midleton – this, astonishingly, is correct! 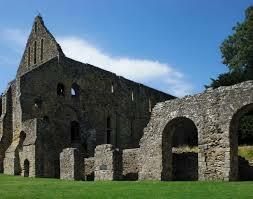 But the date seems to be wrong – other, more reliable, sources suggest that this abbey was founded in 1180. Other sources also agree that the monks came from the Abbey of Nenay or de Magio better called Monasternenagh in County Limerick. Lewis never identified the order that inhabited this ruined friary in Adare. It is the Franciscan friary, founded in the 1400s, the last of the religious houses built in Adare in the medieval period. The Franciscans were known as the Grey Friars or the Poor Friars. The ruins are now situated in the middle of a golf course! But to attribute the foundation of the abbey to a certain ‘Barry Fitzgerald’ really takes the biscuit! There is ABSOLUTELY NO RECORD of this name in Anglo-Norman Ireland! It seems that the surnames Barry and Fitzgerald were combined to create a non non-existent name. One thing is absolutely clear – Barry Fitzgerald never existed. So if you are reading the Wikipedia entry on Midleton – please ignore the reference. 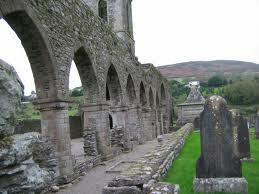 Monasternenagh was a Gaelic Irish foundation – and it supplied monks to other monasteries in Munster. These monasteries were Inislounaght (Co. Tipperary), Odorney (Kerry), Holy Cross (Tipperary), Chore/Midleton (Cork), Feale (Limerick). All of these monasteries were founded by Gaelic kings or lords either before the arrival of the Anglo-Normans or in Gaelic areas of the country. Samuel Lewis (c1782-1865) took his information from local informants or correspondents and on the available published sources. He didn’t visit Ireland to research his Topographical Dictionary. Sadly, his sources were often wrong. Bizarrely, in his introduction, Lewis acknowledges this by stating that there was a serious paucity of works on Ireland that were available to be consulted and this required ‘greater assiduity in the personal survey.’ Regrettably, Lewis wasn’t assiduous enough on the historical data. One thing I must acknowledge is that he gives excellent data on pre-famine Ireland in his 1837 first edition and in his 1842 revised edition. Lewis is fine for details of his own time or anything after 1600. But before that date, his data must be treated with caution. Caveat lector indeed! PS: Sadly, the person who wrote the Wikipedia entry on Midleton failed to examine more recent publications and has repeated a version of Samuel Lewis’s history of the town. Hopefully this will be amended in future. Before Midleton there was……Mainistir na Corann. Sign erected at the Waterford/Youghal entrance to Midleton in autumn 2014. The Cistercian monk weilding a sickle makes sense for the foundation of the abbey in 1180 , but the Anglo-Norman knight suggests a lack of research. Is he the mythical ‘Redmond Barry’ who supposedly founded the abbey? A figure in Cromwellian or Restoration costume might make more sense for the Charter of 1670. The sheaf of wheat or barley on the main sign represents the distilling tradition of the town. The coat of arms was only granted in the late 20th century to the town council, which was abolished in a local government ‘reform’ in 2014. 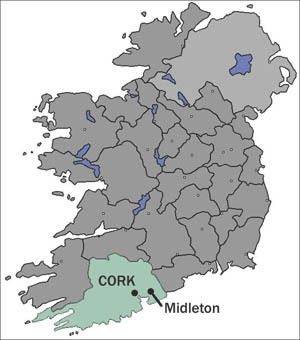 As I mentioned in a previous post, Midleton became the name of a a settlement in eastern County Cork only in 1670 when King Charles II granted a charter of incorporation to St John Brodrick, the local landlord, and thereby set up the town of Midleton as a parliamentary borough. 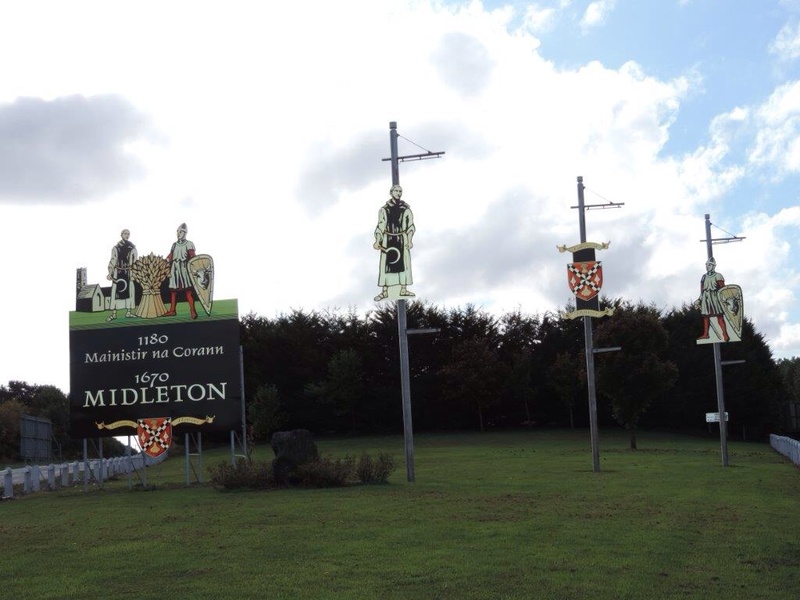 Today as you approach Midleton from either Cork or Waterford, the visitor will notice large signs giving two names – Mainistir na Corann 1180 and Midleton 1670. It seems odd that a town should have two foundation dates, but actually the town only has one foundation date – 1670. 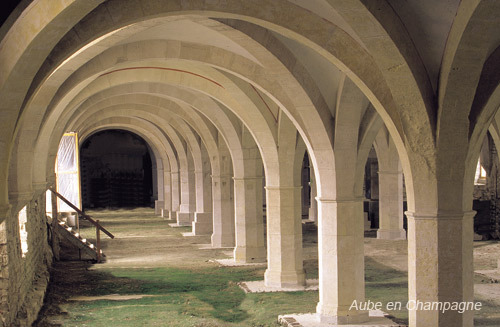 The other date refers to the foundation of a Cistercian monastery on the site in 1180. 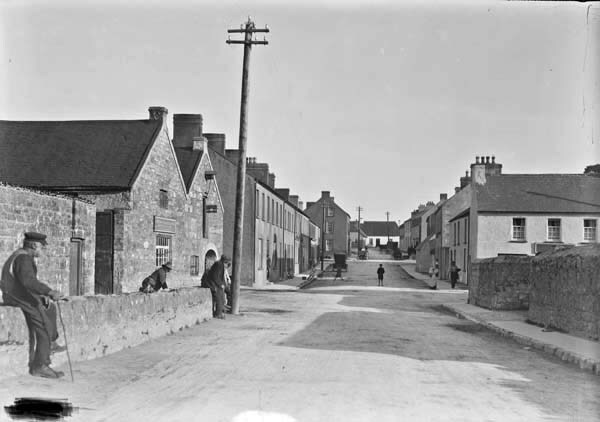 As a schoolboy in Midleton one of the earliest things I learned was the name of the town in Irish – Mainistir na Corann. We were told that this meant ‘the monastery of the weir.’ It was explained that there was a monastery where the town was now built and, to my great disappointment, it had disappeared long ago. Cloyne Round Tower is the last remnant of the early Christian monastery that dominated the religious life of much of East Cork before 1200. This illustration by Mariane Nicholson was published in Thomas Crofton’s book ‘Researches in the South of Ireland’ (1824). Much later I learned that the monastery was not as old as St Colman’s monastery at nearby Cloyne, St Declan’s monastery in Ardmore, County Waterford, or St Carthage’s important monastery at Lismore, also in County Waterford. Midleton only really paid attention to the pre-1670 heritage in 1980 when the parish celebrated the foundation of the monastery eight centuries earlier, in 1180. There was an exhibition of books and manuscripts from the library of the nearest Cistercian monastery – Mount Mellary in County Waterford. A small monument was put up in the town and a booklet published to commemorate the foundation. And that, basically, was it. One thing we didn’t do was highlight the remains of the monastery because there is nothing left of it. It seems that the last remnants were swept away to pay for building St John the Baptist Church (Anglican) in the 1820s. Quite literally the Cistercian abbey has, it seems, been wiped from the face of the earth and is only commemorated in the Irish name of the town. But to confuse matters, when the Christian Brothers came to Midleton to run a school in the 1860s, they were settled at part of the former Hackett’s Distillery on the Mill Road. It was remarked then, and since, that this was the site of the medieval monastery. Certainly there’s a weir nearby, and the Cistercians had owned the site at Broomfield up to the Reformation. But I’m suspicious – did someone get their facts about the precise location of the abbey mixed up, or did the facts arrive after the arrival of the Christian Brothers? When your town or locality doesn’t have a local history society to promote considered and careful research (and knowledge) then stories will come about that make no sense. The present Church of St John the Baptist in Midleton is the third or fourth one on the site. It is believed to stand on the site of the Cistercian abbey that gave us the name Mainistir na Corann – the Irish name for Midleton. The present Anglican church was built in 1825 to designs by James and Richard Pain. The foundation of the Cistercian abbey is also repeatedly ascribed to the Anglo-Normans (my paternal ancestors), who arrived in Ireland in 1169 and only took Cork in the later 1170s. So the foundation by ‘Redmond Barry’ was thought to be correct – it’s given by Samuel Lewis in his Topographical Dictionary of Ireland (1837). This is specious nonsense – but it is repeated ad nauseam, even on the Wikipedia entry for Midleton. This early period is little studied due to lack of surviving documents – but in the 1940s this myth of a Norman foundation was firmly debunked by Denis O’Sullivan in the Journal of the Cork Historical and Archaeological Society. 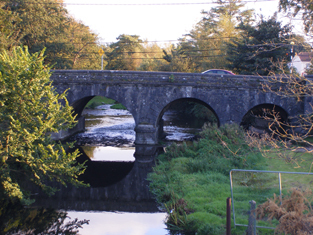 The five arched bridge over the Owenacurra River in Midleton in the evening sunlight. This bridge carries the road to Cork. The river is not especially deep here – I stood in the middle of it just below the bridge last summer, without getting my feet wet (and there was water flowing around me). The Owenacurra can be particularly shallow after a dry spell, but it can transform into a raging torrent after heavy rains. What I am going to do is explore Midleton before Midleton, just to set the record straight, and throw in a few ideas of my own. If I upset anyone still clinging to outmoded ideas, tough! History is about revision – not for the mere sake of revision, but to gain a more accurate picture of the past. I do hope you’ll join me on this exploration.